With QB DeShone Kizer missing time in this game, QB Kevin Hogan found TE David Njoku for a score, however the rest of the scoring would go to the Ravens, as they would put up 21 points by halftime, including two QB Joe Flacco touchdown passes and a RB Terrance West rushing score. 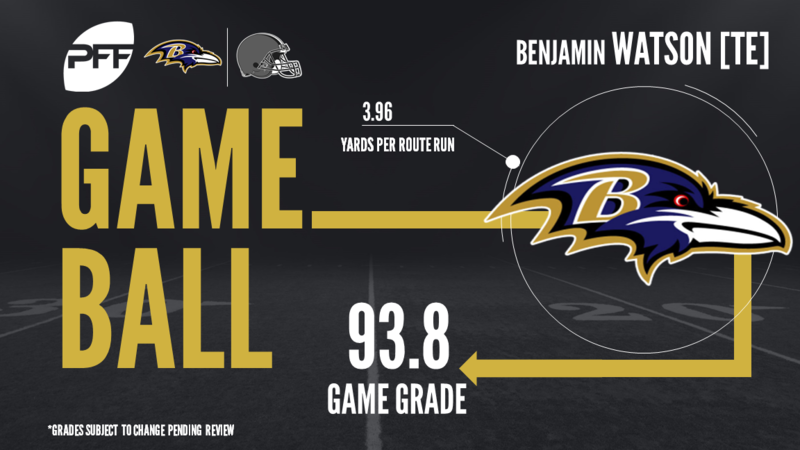 The Ravens finished the game with a field goal late, and a 24-10 victory, and with that, we give you our PFF exclusive takeaways from the contest for each team. Flacco looked solid in a gameplan clearly designed to keep things simple for him. He was extremely accurate, finishing the game with an adjusted completion percentage of 83.9 percent. That was largely thanks to 24 of those 31 attempts being less than 10 yards downfield. However he looked solid when he did have to go deep, completing 4-of-7 for 71 yards and a touchdown on passes more than 10 yards downfield. He did have an interception, but that was more a miscommunication between him and his receiver than it was a bad pass. It was a very impressive game from the seemingly ageless TE Ben Watson. His receiving numbers were impressive, catching all eight targets he saw for 91 yards, 40 of which came after the catch. That works out to a 3.96 yards per route run average, a very good number. Many of his catches went for huge first down conversions as he was clearly Flacco’s security blanket. But what was equally impressive was Watson’s run blocking. He was consistently sealing the edge on outside runs and finished the game with an 88.5 run blocking grade. Carr started off the day by finding his way into the hip pocket of Kenny Britt and from there he spent all afternoon making life difficult for Browns’ receivers. Carr was targeted ten times in coverage on Sunday and he allowed just three of those balls to be caught for a total of 37 yards while grabbing an interception and breaking up an additional pass. Browns QBs had just a 2.9 passer rating when targeting Carr on the afternoon. The first round pick from Alabama only played 11 defensive snaps but they were active ones as was targeted three times on the afternoon. He allowed just one of those balls to be caught for a total of just three yards. Humphrey also defended a pass on the day and made two stops. In simplest terms, Kizer looked like a rookie making his second ever NFL start against the Ravens. Whether it was his accuracy, decision making or ball security, the kid from Notre Dame simply didn’t have it in Week 2. Kizer completed just 13-of-25 attempts for 149 yards and three interceptions on throws coming under no pressure and on throws traveling at least 10 yards through the air down field he was just 3-of-11 for 83 yards and two interceptions. Higgins led the Browns with 11 targets in Week 2, hauling in seven of them for 95 yards – 30 of which came after the catch. Higgins ran 88.4 percent of his routes out of the slot, where he averaged a robust 2.39 yards per route run against Baltimore; he also caught passes while matched up against five separate defenders in coverage. While not much went right for the Browns on defense, veteran corner Jason McCourty was one of the lone bright spots. McCourty was strong in run defense, making a couple of run stops out on the edge and forcing others back inside. In coverage, he was targeted just five times in 36 coverage snaps (7.2 coverage snaps per target) and didn’t allow a single reception. He had an interception on a deep throw by Flacco and also had another pass defended. On top of that, he forced a fumble late in the game to give his offense a small chance to make a comeback. While the Browns secondary actually played fairly solid, and their defensive line was up and down, it was the inside linebacker trio of Kirksey, Collins and Schobert that really struggled for the Browns in this game. Flacco picked on them nearly exclusively in the pass game, working his receiver and tight end matchups any chance he could against them. The three combined to allowed 17 catches on 17 targets for 159 yards and a touchdown. They each missed a tackle and really struggled to escape blocks at the second level in the run game. None of them finished with a run defense grade above 40.0 on the game.